The financial matters having been dealt with, it is now time to focus on how the research was conducted. I will do so by listing the research highlights in a chronological order. A specific scientific outcome will emerge from each of the following 18 events. 50ème anniversary of ISOCARP: Promotion of Convivial Regions. The Australia is the size of Europe. It is a single country, made of 6 States. The 18 events reported above allowed to experience (very) large distances, while retainging a sense of unity. A network thus gradually built itself, weaving together concepts, organizations and reference areas. Specific references for each event will be provided, including scientific contributions to the research. These contributions will be used for the presentation of the results. Each event sheds light on the study, and bring new outcomes to the fore. The River Symposium is organized by the IWC. One of the assistants, Delphine Gonchond, is French, which facilitated the start of the study. In addition to the numerous technical presentations of exemplary projects of river rehabilitation and protections throughout the world, the exhibition stalls enables a better understanding of the way Australian organisations contribute to a quality of management of rivers. The Facilitators’Guide to Indigenous Water Planning (Tropical Rivers and Coastal Knowledge). This guide has a wealth of information for water planning which takes into account the cultural and spiritual values of water. My participation in the workshop of the Peter Cullen Foundation (http://www.petercullentrust.com.au/), entitled “Linking people, projects, and rivers to reach the goal” allowed me to learn more about the work of the man who played a significant role in the rehabilitation of the Murray Darling Basin and saved Lake Eyre, amongst other actions related to water. The Congress was opened by Bill (William) Twitchett, an Australian architect and planner who lived in France for 50 years and with whom I have worked professionally and associatively for 25 years between 1984 and 2009. He maintained strong links to Brisbane, where he studied. The case study presented, ” Mining, Environment and Society”, was grounded in the thought of Whitehead as applied to the methodology of assessing the water that can really be mobilized in the Kimberley and Canning Basin in Australia”. (See Appendix_Evenements_ISOCARP). This case study, which critically evaluated current planning policies and procedures in the Kimberley was well received by the Australian members of ISOCARP (including Bill Twitchett and the organizer of the Congress, his childhood friend, Jim Colman) – thanks to the quality of its information, it’s very strong documentation, and an approach based on verifiable facts. The rapporteur of workshop 2 “Valuing What Exists” acknowledged and quoted a large part during the final reporting session of the Congress, but it was not included in the final book made by Jim Colman. In a personal encounter Jim Colman repeated 3 times “Aboriginal people … it’s impossible to understand them!” Probably, many Australians WILL NOT understand. It appears that many Australians do not understand the circumstances Indigenous Australians have to endure. This Post-Doctorate study aims to find a way to generate genuine dialogue, on organic thought basis. One of the participants, Isabel Buitrago-Franco, from the Centre for Social Responsibility in Mining, UQ, also attended the next event, which took place in Armidale. The title of the program “mining operations in a sustainable world: environmental, social, and economic policy issues” appeared at first to assume that a mine could be sustainably developed. The basic principle of the discussion was in regards to active non-violence, which allows for a constructive dialogue particularly when difficult issues are discussed, and strong contrary opinions are expressed. The public inquiry into the Duchess Paradise coal mines was taking place at the time of my second visit in Australia. Rey Resources Limited (Rey) propose to develop the ‘Duchess Paradise’ project based on a thermal coal deposit located in the basin of Canning/Fitzroy Trough located some 135kms south of Derby in the West Kimberley region of Western Australia. Rey proposes to carry out slot excavation and high wall mining in natural wilderness, followed by potential underground and open cut mining. The coal retrieved from the mine would then be transported by road to the port of Derby Export where it would be stored, loaded on barges and transferred to seagoing ships moored in the Derby Port. The journalists compare the situation in Australia to a horse race. The two head horses are the ‘Economy’ horse, and the ‘Ecology’ horse. The two horses are side by side and no one knows who will win the race. A movement is rising in favour of Ecology, but this global movement of society is not yet a majority and extremely destructive projects are voted (the coal mines of Queensland, shale gas…). Simply complying with the environmental legislation already in place would enable industrial and mining projects to be developed with due consideration for potential environmental impacts. Kimberley traditional owners do not reject development per se; they express the need for rigorous scientific surveys of potential ecological impacts to be undertaken before any major decision is made. the issue of wetlands (‘a paradise for birds and animals’ – hence probably the name of the place), and the inter-dependent micro-organisms and other ecosystems which enable their survival. The National Water Quality Management Strategy (NWQMS) is a joint national approach to improve the quality of waters in Australian and New Zealand rivers. It was initially approved by two Ministerial Councils – the former Agriculture and Resources Management Council of Australia and New Zealand (ARMCANZ) and the ex- Australian and New Zealand Environment and Conservation Council (ANZECC). Since 1992, the NWQMS has been developed by the Australian and New Zealand Governments in collaboration with State and Territory Governments. Continuous development is currently overseen by the permanent Standing Council on Environment and Water (SCEW) and the National Health and Medical Research Council (NHMRC). The NWQMS aims to protect the country’s water resources, improving the quality of the water while supporting businesses, industry, the environment and the communities that depend on water for their continued development. This study trip allowed me to meet Aboriginal people in their communities, and to see Nyikina country. It was also an opportunity to finalise a documentary called “Three Sisters” which was to be presented in Montpellier at the 4th Forum on Resilience, and also at the Festival du Film de Rochefort Pacifique (see below). The old Liveringa Station where current Nyikina Elders like Jeannie Wabi were unpaid servants (slaves) of the white pastoralists. The meeting with Christine Black, an Aboriginal academic whose work as a specialist lawyer in jurisprudence centres on the large estuaries of the world, made me aware of the fact that there was a radical difference between the Western legal system and the Aboriginal legal approach. Western law is not based in the land, but on the needs of society for productive development, always disconnected, at the root, from country. That is why legislation is so destructive of the environment. Developments are approved to allow for more development, and to remove the obstacles which would prevent them from being carried out. Aboriginal Law is based in the land, and country is the source of the law. It is the title of Christine Black’s major work: The Land is the Source of the Law, Routledge, 2010, 224 p. This book gives an inter-governmental perspective of Indigenous jurisprudence: by comparing Indigenous legal systems in New Zealand, the United States and Australia, it offers a “Dialogic encounter with an Indigenous jurisprudence” in which individuals are defined through their rights and responsibilities towards the land. This approach shines a new light on the theme of the ISOCARP Congress itself: is the change in planning legislation aimed at protecting the environment, or is its purpose to waive what prevented its destruction in order to allow for more development? In both cases, sentences such as “Ensuring the supply security of mineral resources” and “ensuring the development of society’ have different meanings. Stephen Muecke, an Australian Professor of Ethnography at the University of New South Wales, was invited by Anne Poelina to participate in a field trip to Lake Eda on the Roebuck Plains east of Broome. There is concern the water quality is at risk contamination and depletion from the nearby unconventional tight/shale gas extraction at the Ungani wells (see the BURU records, Appendix Buru). Gularabulu: Stories from the West Kimberley, Fremantle Arts Centre Press, 1983. Reading the Country: Introduction to Nomadology Fremantle, 1984, with landscape painter Krim Benterrak. This award-winning book is an ethnographic work about the Roebuck Plains, a RAMSAR site, near Broome. It relates a trip undertaken in 1984 with Paddy Roe on a traditional songline. Paddy Roe was an Elder of the Gularabulu and Nyikina people. I retraced Paddy Roe’s songline on geographical maps and discovered that the route of this songline corresponds to a contour, probably that of the sea level when the first Westerners arrived, which would explain some of the stories associated with this songline. How is it possible to allow gas exploitation, and of shale gas exploration in such close proximity one of the most significant RAMSAR sites? The purpose of this field trip was to record the current state and quality of the environment in this area. This conference enabled me get an update on the progress of development in the Kimberley region as well as the corresponding actions of environmental protection groups. The site is near the Fitzroy River, a national heritage site. It is home to 40 species of fish, including the famous Barramundi and endangered freshwater sawfish. Dangers for the Fitzroy River include acid run-off, heavy metals contamination and salt leaching into the waterways. Transport: with the mine in full production, there would be 144 x 100 tonnes of noisy dangerous “road trains” traffic per day between the mine site and Derby, which means a truck every 10 minutes, 24 hours a day, 7 days per week. Risks to the King Sound: the coal will be loaded on barges at Derby Wharf and then loaded onto ships. Risks of pollution to the King Sound include dumping, coal dust and air pollution. Scientific uncertainty: scientists do not have enough data on the river and the groundwater system to be able to foresee the impacts that the project could have. This lack of rigorous scientific data is raised by many stakeholders, and is highlighted in many of the studies on Northern Australia as a whole, including NASY and NAWFA studies, which will be examined further below (except for a few well documented specific points, which Kimberley is not a part of). My participation to this event was as a Research Fellow of the LOTERR laboratory. It can be seen as a highlight of my postdoctoral research. 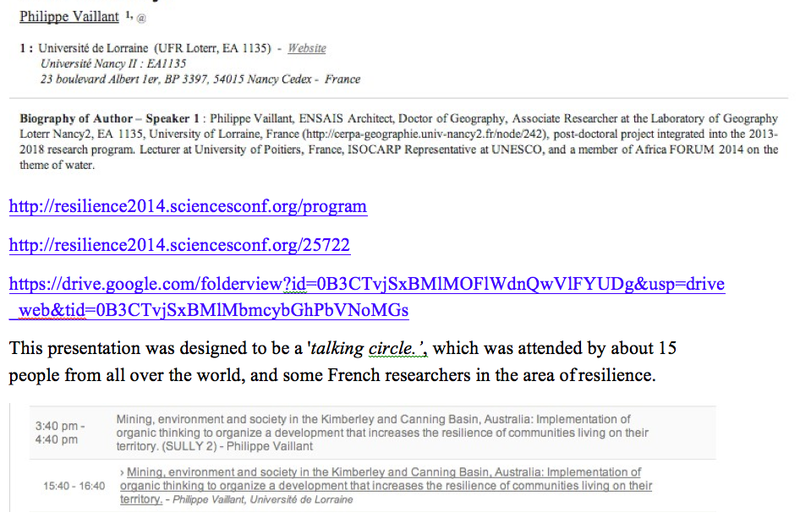 This presentation was designed to be a ‘talking circle.’, which was attended by about 15 people from all over the world, and some French researchers in the area of resilience. This presentation came just after the presentation of Magali McDuffie’s 55-minute documentary entitled “Three Sisters; women of high degree”. This conference on the theme of coal seam/ shale gas brought together about 50 people from France and all over the world. A 2008 map was presented, created by an American University and detailing the mining concessions of the major companies in the whole of the Mediterranean basin. Given that a period of 3 years is necessary to draw up such a map, it can be assumed that as early as 2005, large corporations divided the Mediterranean region among themselves so as to carry out shale gas extraction. It is astonishing to note that this corresponds to the period of popular uprisings. A parallel was drawn between the Great Transatlantic Market (GTM) and the Transpacific Partnership, its equivalent on the other side of the planet. These agreements are in the spirit of the NAFTA, signed 20 years ago. This latest agreement has kept its promises profitwise, but for whom? Indeed, more than 7,000,000 farmers stopped their activity between 1995 and 2015 (see the article giving Olivier de Schutter’s explanations. De Schutter is the special rapporteur of the United Nations regarding food rights). This exchange made everyone aware of the unprecedented global extent of neo-liberalism, with predictable disastrous social consequences (that is why these agreements were kept secret until November 2014, “in order to preserve the peacefulness of discussions”, but especially to prevent the population uprisings which had, in the past, stopped the implementation of OMC projects). These debates are now in the open, but still largely in English, and often released confidentially. 1.D.10. Forum at “La Chênaie de Mambré” at Brainville-sur- Meuse. At this conference, the waters of Mardoowarra were merged with the waters of the Meuse, from the old stone Roman bridge of Brainville-sur-Meuse. This exchange of memory between two of the oldest rivers in the world promotes the need to protect river systems for their surrounding communities. This event was the subject of a publication in Australia for the Peter Cullen Foundation. 1.D.12. 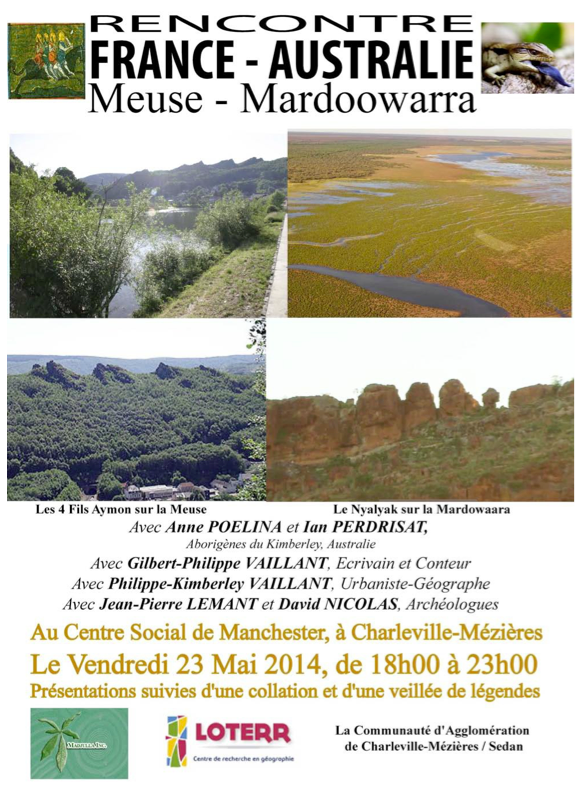 The Meuse-Mardoowarra Conference, Manchester Social Centre, Charleville-Mézières, May 23rd, 2014. The Charleville-Mézières conference drew a parallel between the legend of the “Four Sons of Aymon” that are inscribed in the landscape of the Ardennes with the four rocks by the Meuse above Bogny and Castle-Raja and the story of the “Four Ngalyak” (pronounced “nga-li-yak”) near the Mardoowarra (Fitzroy River) ,which describes the creation story of the four rocks at the top of the cliff which towers over the Looma Aboriginal Community in the West Kimberley. Aboriginal people speak of ‘songlines’ or ‘tracks of songs’, which map country. In France, we speak of “chansons de geste”.They both use an analogy in stories that call for action on the land. The famous writer and storyteller from the Ardennes, Philippe Vaillant (my namesake), was able to develop this theme in an evening divided into three parts: scientific presentations, meal/unstructured discussion, and storytelling. This project received funding of €1,000 by the Community of Urban Areas of CM-Sedan. The Rochefort Pacifique Film Festival was the opportunity for the second presentation of Magali McDuffie’s documentary “Three Sisters; women of high degree”. One of the three sisters is Anne Poelina. This Festival was marked by an encounter with Barbara Glowczewski, Professor at the Collège de France. Barbara is the author of numerous books on Aboriginal cultures. Her work is based on the work of Guattari, Deleuze, Heidegger, her fieldwork explicitly reveals an organic approach and shows the relevance, appropriateness, and applicability of an organic approach. G.Deleuze explained at the end of his thesis Difference and Repetition, that he is looking for concepts of a different nature, such as “the list of empirio-ideeles notions found in Whitehead, and which make Process and Reality one of the greatest books of modern philosophy ” ? (Deleuze, R & D, PUF, 1968, p.364). This is why the links between the work of B.Glowczewski and organic thinking would perhaps prove fruitful in the future, and would be useful to express the importance and brilliance of Aboriginal thought. This Forum was the opportunity for me to deliver a 25-page scientific presentation (including 5 pages of bibliography) on the drops of experiences as applied to the problem of water. This presentation was followed by a presentation from Ms. Janine Marin who used the methodology of the drops of experience on 5 case studies throughout the world (see description below and Appendix_Evenements_UNESCO). This Congress was organized by myself, together with a team of engineers from Charleville- Mézières. It was an opportunity to tackle the issue of water, in both its cycles (natural and artificial) in order to go back to the concept of water quality described in the European Directive of 2000. My experiences in Australia have been very useful to coordinate actions in the Urban areas of Charleville-Mézières-Sedan. 1.D.16. Setting up of a Puppet & Dance Show “The Ngalyak and the Flood: Mardoowarra to the Meuse”, TPFI ‘OFF’, September 2015. The link between water, country, and culture was highlighted in the performance produced for the International Puppet Festival. This performance created a link between the Legend of the 4 Sons of Aymon, embodied in four rocks near the Meuse River, and the Aboriginal Creation Story of the four Ngalyak babies, embodied in four rocks near the Mardoowarra in Australia. This show also had a scientific dimension with the role of the diatoms being highlighted (microscopic plankton which is the key to healthy water). It was also cultural, through storytelling, and educational, with the inclusion in the performance of 60 children of the Manchester area, and 70 Aboriginal children from the Kimberley. Science, Culture, and Education are the three main priority areas of UNESCO. There were 7 performances and the success of the show was such that the International Festival of Puppetry “IN” is interested in presenting it for the September 2017 Festival. The participation of people of all walks of life is something Jacques Felix intended when he created the festival in 1961. Our French-Australian Partnership was presented at the Saint-Dié International Festival of Geography by Gilbert-Philippe Vaillant, storyteller, wordsmith, and Philippe-Kimberley Vaillant, geographer. The talk aimed at showing how organic thought enabled an understanding of the triple link between water, landscape, and culture. This connection, which Nyikina people call “liyan” in their language, is still very much alive in Australia, and also in the Ardenne, a region of legends. 1.D.18. 50th Anniversary of ISOCARP : Promotion of Convivial Regions, 19-26th October 2015. Organic thought, as applied between the Kimberley and the Ardenne, can help develop the connection to country on all the different scales, particularly at the scale of the “friendly region”, covering an area of about 32,000 km2. My work at IWC enabled me to become immersed in the Australian culture of water which holds both a scientific and cultural dimension. .
Brian McIntosh introduced me to the Australian model of water assessment, and I also benefited from the invaluable insights of Mr. Robert Argent, Director of the National Meteorological Service. Sarah Grant conference on ‘The way the Aboriginal peoples approach water at IWC with Dana Kelly. Sarah Grant, Queensland Aboriginal consultant organised a conference which was followed by a role-playing game aimed at furthering people’s understanding of the mechanisms which lead to a dismantling of the relationships between Aboriginal peoples and their territories and water. The works of Denisson and Oliver on the Fitzroy River are in agreement with the concept of the drops of experience. Many contacts have been made for further research.